Herb Buttery Smashed Potatoes is the simplest side dish, but so tasty. 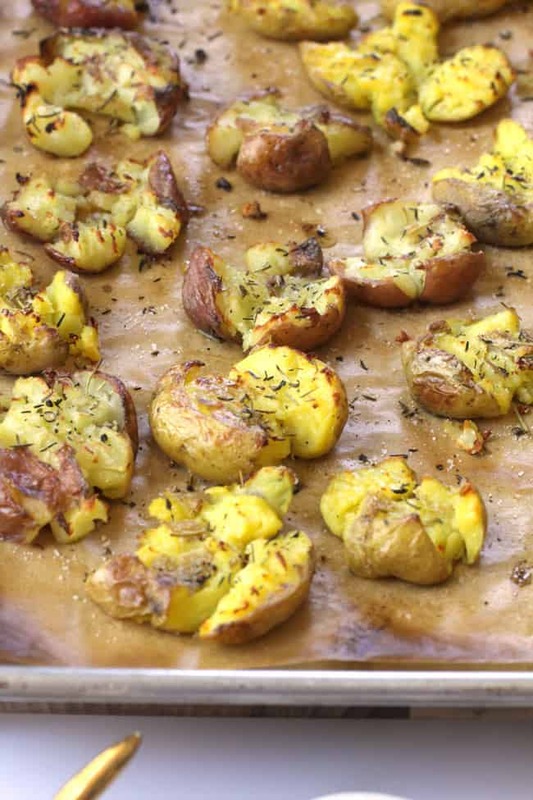 The combination of herbs and seasonings, and a butter mix, on simple baby potatoes – is drool worthy! We eat loads of potatoes at our house. Red, yellow, russet, and sweet. If there is a potato in the house, it’s NOT gonna go to waste, that’s for sure. Maybe it has something to do with raising boys and having a husband that carb loads before big runs. Or maybe it’s because we just simply love them. I say all of the above. 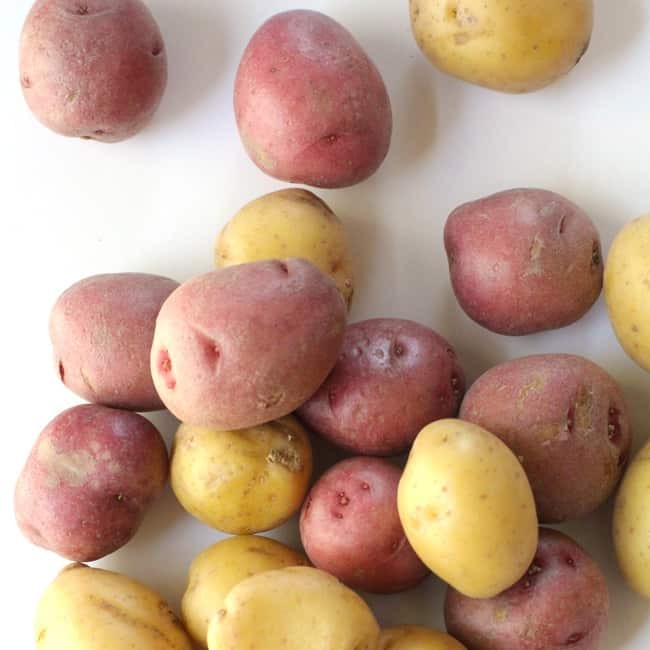 THESE potatoes? Well well well. They are so many things. Let’s go shopping. Here’s what you’ll need at the grocery store to make these amazing little things. 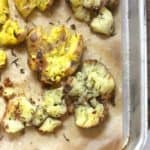 How do you make Herb Buttery Smashed Potatoes? Wash potatoes, and place in stock pot. Cover them with water and a good amount of salt. Boil potatoes until fork tender. Cool slightly. Arrange potatoes on baking sheet and smash them with a fork (or a potato masher), making sure that the flesh is exposed. Brush potatoes with butter/olive oil mixture. 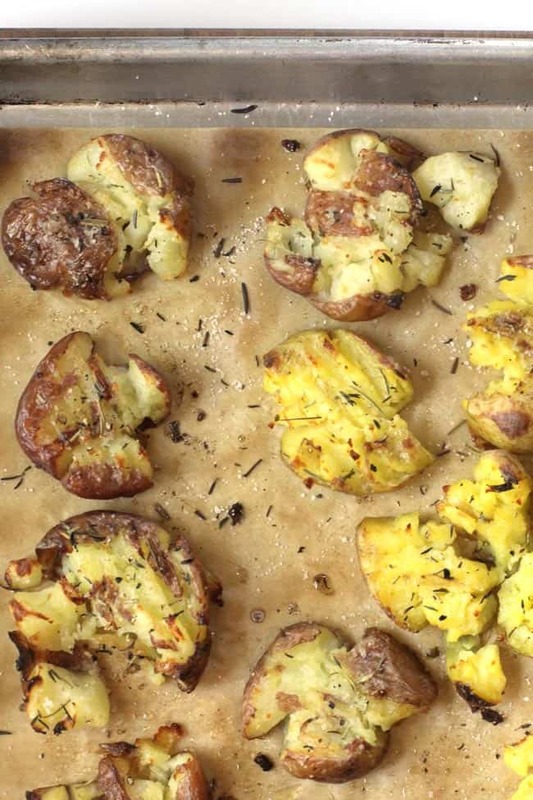 Sprinkle the herb mixture evenly over the smashed potatoes. Bake, and then broil at the end to get them nice and browned. I’ve also got a few things in mind for a main course. You could just grill up steaks, burgers, or chicken. Or you could grab one of the following recipes. I suggest making a double batch if you are feeding a large group. Herb Buttery Smashed Potatoes is the simplest side dish, but so dang tasty. 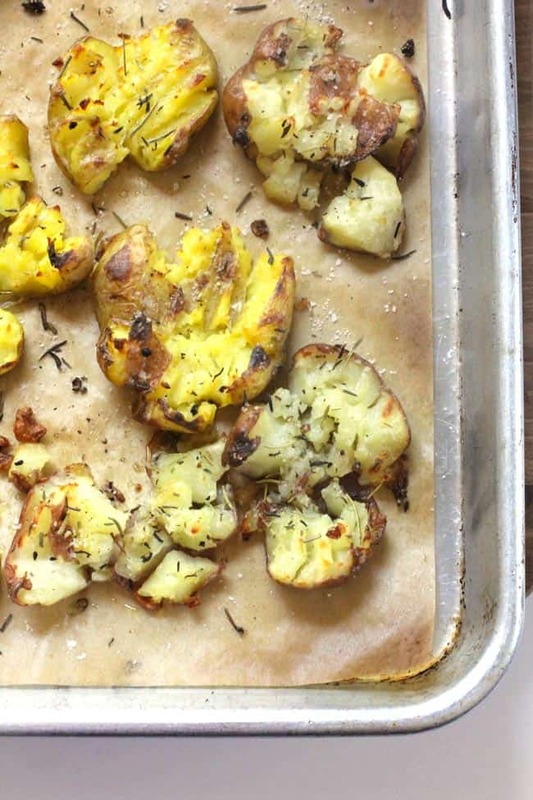 The combination of herbs and seasonings on simple red potatoes is drool worthy! Preheat oven to 400 degrees. Combine butter and olive oil in small dish. Set aside. Combine the seasoning mixture - the salt, pepper, thyme, and rosemary. Set aside. Wash potatoes. Place them in a medium stock pot, and cover with water and salt. Heat to boiling, and then reduce heat to medium. Cook until fork tender, and strain water off of them. 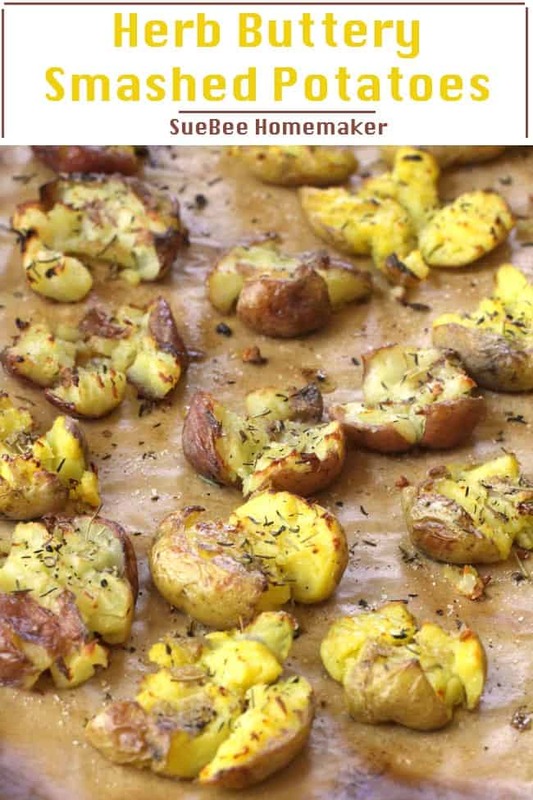 After they cool for just a few minutes, lay them on a baking sheet prepared with parchment paper. Use a fork to smash, so that the potatoes flesh is showing. Brush with melted butter and olive oil mixture. Then sprinkle with seasoning mixture. Bake in oven for about 15 minutes. Then turn heat up to broil for just a few minutes, or until they are nice and golden brown. Broiling at the end is optional, but will ensure nice browning on top. Double this batch for a large group. You will need two baking sheets. I love it! Seven simple and easy ingredients. Way to make it easy for us novice 👩‍🍳. Excited to smash!